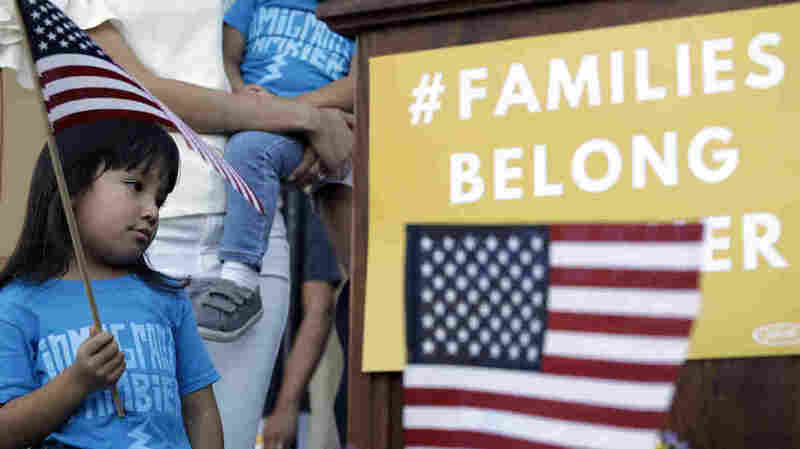 Judge Says Yes To Lawsuit Challenging Trump Administration Family Separation Policy In a response to the Trump administration's request to dismiss the suit, Judge Dana Sabraw ruled that the "wrenching separation" of children from parents may violate their right to due process. Andrea Elena Castro, daughter of Rep. Joaquin Castro, D-Texas, holds a U.S. flag during a Rally For Our Children event on May 31 to protest the "zero tolerance" immigration policy that has led to the separation of families. Hundreds of children have been separated from their parents as a result of the Trump administration's "zero tolerance" policy for people who cross the Southern border illegally — even those who are requesting asylum in the U.S. The administration moved to dismiss the case in early April. But Sabraw refused, ruling that the "wrenching separation" of children from their parents may violate the families' right to due process. "In the most forceful language, the court rejected the Trump administration's claim that the Constitution permits it to engage in the inhumane practice of tearing little children away from their parents," said Lee Gelernt, the deputy director of the ACLU's Immigrants' Rights Project.